MATANZAS CUBA. LOS TRABAJADORES DE LA EMISORA PROVINCIAL DE RADIO 26 DURANTE UN MATUTINO ESPECIAL CONDENARON LA DECISION DE LA CORTE SUPREMA DE LOS ESTADOS UNIDOS DE NO REVISAR EL CASO DE LOS CINCO HERMANOS ANTITERRORISTAS PRESOS INJUSTAMENTE EN CARCELES DEL IMPERIO. A ESTE ENCUENTRO DE SOLIDARIDAD CON NUESTROS COMPATRIOTAS SE SUMO EL GRUPO DE CORREDORES MATANCEROS POR LA LIBERACION DE LOS CINCO ENCABEZADO POR SUSANO MENDOZA QUIEN EXPRESO QUE ESTE ES UN MOMENTO DECISIVO DE LA PATRIA , UN NUEVO BARAGUA DE VERGUENZA Y RESPETO. 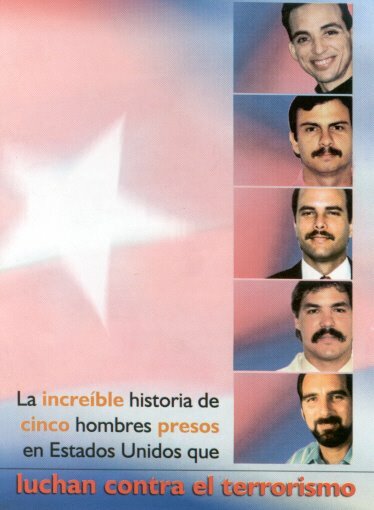 REFIRIO QUE SI ALGUIEN NO PUEDE CANSARSE DE REPETIR UNA Y MIL VECES VOLVERAN SOMOS NOSOTROS LOS CUBANOS UNIDOS A LOS COMITES DE SOLIDARIDAD INTERNACIONAL Y AFIRMO QUE COMO DIJERA GERARDO UNO DE LOS CINCO, QUE MIENTRAS HAYA UN HOMBRE FUERA DE LA CELDA LUCHANDO POR LA LIBERACION DE ELLOS TENDRAN LA ESPERANZA DE REGRESAR AL SENO DE SU FAMILIA Y DE LA PATRIA PORQUE SON INOCENTES. PERIODISTAS Y TRABAJADORES DE RADIO 26 REVELARON QUE UNA VEZMAS SE HA PUESTO DE MANIFIESTO LA ARBITRARIEDAD DEL GOBIERNO CORRUPTO E HIPOCRITA DE LOS ESTADOS UNIDOS QUE MIENTRAS ACOGE EN SU SENO AL ASESINO DE POSADA CARRILES CONDENA CINCO CUBANOS POR COMBATIR EL TERRORISMO. Y POR ULTIMO DIJERON QUE SU MISION PRINCIPAL ES LA DE DAR A CONOCER LA VERDAD EN EL MUNDO.